Charm and elegance distinguish this farm in the heart of Serra de Sintra, 15 minutes by car away from the beach and the golf court. 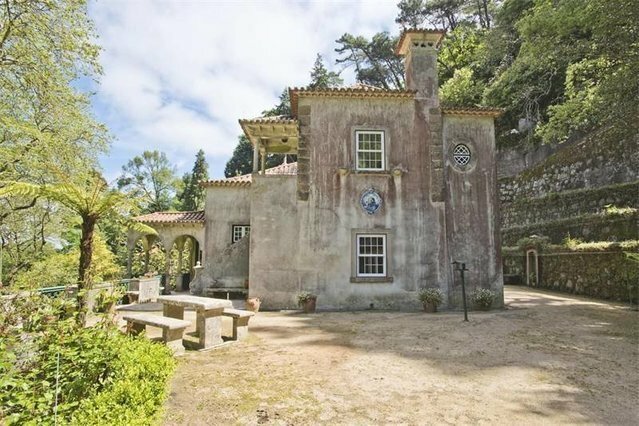 This property, involved in the magic and fragrance of a place full of history, surrounded by the most luxurious green tones of Sintra, on the Palácio da Pena road, is a privileged scenario that has always been a loved destination of the royalty, poets and writers. It is a manorial house of the XVIII century with 9 rooms divided in 2 floors plus an annexed living room, bedroom and bathroom. This is an elegant and lovely house that needs total refurbishment, but with a huge potential, preserving its original trace, which distinguishes it and makes it unique. Here, you can find peace and serenity, "away from everything", in the middle of the luxurious green slopes that sustain Parque da Pena. Besides the front garden, with astonishing views to the hills and Sintra valley, this 1,7 hectares property is covered with exotic trees, fruit trees and flowers, interspersed with mysterious ways surrounded by bushes and rocks, caves and water sources that challenge our fantasy and bring us back to the romanticism period, with a lake that ends in a beautiful chapel, a detail that deserves highlighting. UNESCO's world heritage, Sintra's village is only a short walk away and Palácio da Pena and Castelo dos Mouros are just a few kilometers from the entrance of the village. It is also a pleasant stroll in the Seteais and Monserrate palaces, going on until the village of Colares and to the sandy beaches, like Praia Grande, Adraga and Praia das Maçãs or to fishing villages such as Azenhas do Mar and Ericeira, famous for their seafood restaurants. Alternatively, you can catch the former typical tramway, recently renewed. To the golf lovers, it is the perfect place to relax after playing in one of the nearby courts and to practice the placement on the front lawn. In this property there is the possibility of buying more 1,7 hectares with a house, which is also available in the market, bringing to a total of 3,7 hectares.